When you're as notorious as Koko, you're bound to attract the attention of the movers and shakers of the intelligence community--especially those parts of it that specialize in regional destabilization. But what happens when different parts of said organization come into conflict over the subject of a rogue arms dealer with an agenda all her own? It's two sides of the same government-backed coin going after each other--and Koko's in the middle. Can she survive being caught in-between? And what happens when she sees that she's being played? Find out in the 7th volume of Jormungand. I really like the premise of this issue, which shows pretty clearly that Koko is not as on top of things as she thinks she is. The fact that she apparently didn't know there was a mole in her organization and that people are tipping to the fact that she keeps Jonah around as a sanity check are going to pose big problems for her in the future. Once again, the veneer of perfection we saw in the first few volumes is cracking, as Takahashi slowly shows that the illusion of control Koko lives in is just that--an illusion. Oh sure, things end up going her way in that she doesn't have to admit to the mole, she whacks her antagonist, and learns a bit about how much the undercover operatives want her but overall, it's clear that we're seeing the beginning of the end here. It might take a few volumes--heck, this is manga after all so it could just as easily take a few dozen volumes--but in the end, like any evil character given the spotlight, Koko must fall. At least, she'd better. I love the work that Takahashi has done here in setting up Koko as seemingly invincible, then starting to knock the pegs out from under her, piece by piece. Sure, she's got it together right now, but how long do you really think Lehm is going to put up with this? When is the CIA going to tire of her antics and try to take her down once and for all? That's to say nothing of her Chinese enemies, her family problems, and of course, random chance. Koko might still be smiling, but if you examine the decisions being made here, either by Koko herself or by others, it sure looks she's in trouble. Takahashi's illustrations continue to be strong, with easy to follow action sequences and facial expressions that can tell you so much without saying a word (or by undercutting the words being spoken). We do have a bit of seinen-required adult imagery, but it's completely within context and is tastefully done. I really like how the inner thoughts of R are illustrated, not just given a thought bubble or dialog box. Jormungand is not only a good story, it's well-drawn as well. 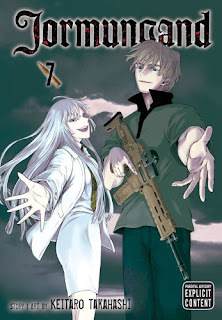 I know I tend to say this every time I review this manga, but I continue to be surprised at how much I like Jormungand. I even recently upgraded it to keeper status, because I know I'm going to want to go back and re-read it once Takahashi has wrapped everything up. This is a very good action story that has just the right amount of comedy and tragedy to give the plot a complexity that other stories of mercenaries lack. This is almost certainly going to make my 2011 favorites list, and I can't recommend it enough, especially for people who are turned off by "typical" manga. This would be right up the alley of any Western comics fan who likes stories where morality is painted in a strong shade of grey. This is Viz Signature at its best, and I can't wait for it to be 2012 so I can read more.